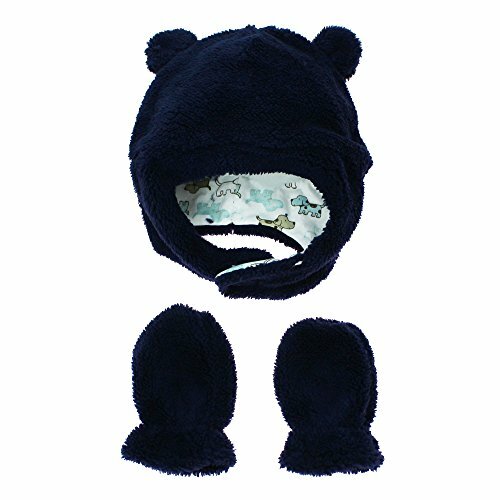 WINTER HAT: pulls-on, cover the ears, and Velcro's under the chin that is sure to keep your child's head warm all winter long. Blue hat has a cute puppy pals cotton lining. Cotton lining is for added warmth and comfort. BEANIE HAT AND MITTENS: are designed to be quick and easy to put on yet soft and comfortable for the child to wear. Little Me outerwear is made to keep children warm but breathable so they do not overheat. BABY MITTENS: pull on with soft elastic around the wrists to help keep them on. No-fuss mittens are easy to put on and take off. Mittens pull on easily to keep hands warm. Mittens can be used with mitten clips or they are small enough to fit into a pocket so they do not get lost. LITTLE ME: For over 40 years; Little Me products let little ones be little; whether they?re napping, throwing cereal on the floor or crawling through deliciously muddy grass. Little Me is constantly developing innovative apparel, accessories and products that nurture discoverhood. Little Me use fabrics like soft cotton, terrycloth and velour. They believe babies should always be comfortable, snuggly and safe, free to do what they do best: play, sleep and thrive. If you have any questions about this product by Little Me, contact us by completing and submitting the form below. If you are looking for a specif part number, please include it with your message.